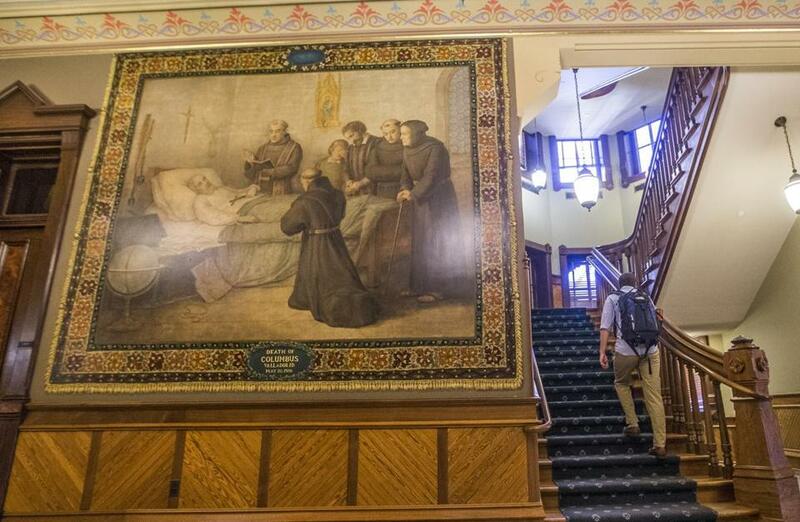 A mural depicting the death of Columbus, one of 12 Columbus murals displayed at Notre Dame. SOUTH BEND, Ind. — The University of Notre Dame will cover murals in a campus building that depict Christopher Columbus in America, the school’s president said, following criticism that the images depict Native Americans in stereotypical submissive poses before white European explorers. The 12 murals created in the 1880s by Luis Gregori were intended to encourage immigrants who had come to the United States during a period of anti-Catholic sentiment. But they conceal another side of Columbus: the exploitation and repression of Native Americans, said the Rev. John Jenkins, president of Notre Dame. It is a ‘‘darker side of this story, a side we must acknowledge,’’ Jenkins said in a letter Sunday. ‘‘We wish to preserve artistic works originally intended to celebrate immigrant Catholics who were marginalized at the time in society, but do so in a way that avoids unintentionally marginalizing others,’’ Jenkins said. In 2017, more than 300 students, employees, and Notre Dame alumni signed a letter in the campus newspaper that called for the removal of the murals. The president of the Native American Student Association praised Jenkins’s decision. ‘‘This is a good step towards acknowledging the full humanity of those native people who have come before us,’’ said Marcus Winchester-Jones of Dowagiac, Mich.
‘‘If we adopt the standard of judging previous generations by current standards, we may reach a point where there are no longer accomplishments to celebrate,’’ Strobl said.